Whether a cupcake in the guise of a hamburger sounds delightful or disgusting to the average reader, I've rarely seen a food inspire so much excitement among college students. Apparently, the amazement extends to others, too: this post was picked up by Jezebel.com, Food2.com and www.recipenut.com! 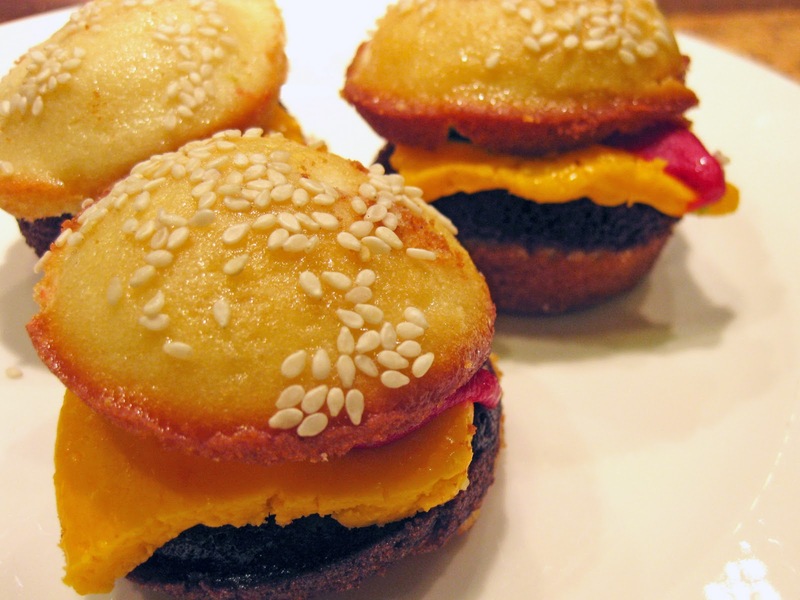 These burger cupcakes are easy to make, but time consuming. 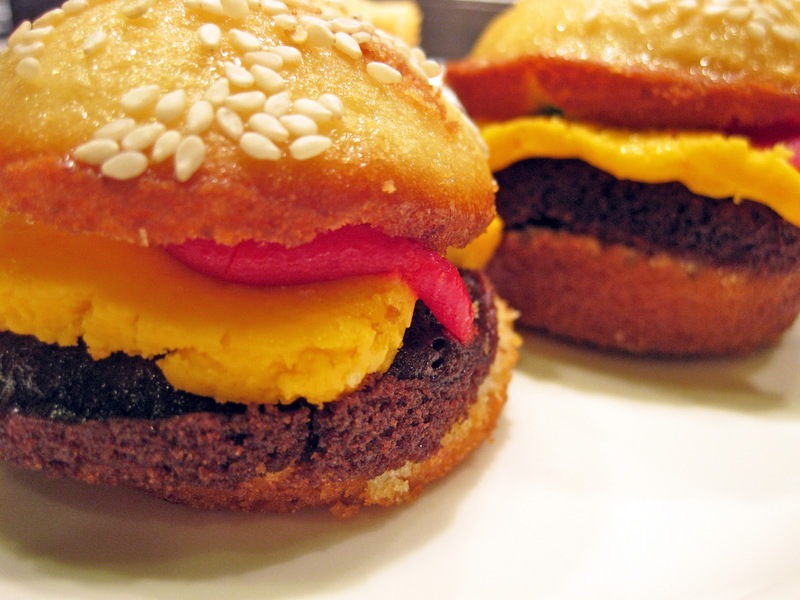 The burger cupcake (or cheeseburger cupcake, if you add "cheese") is a slice of chocolate cupcake inserted between a halved vanilla cupcake and decorated accordingly with frosting and sesame seeds. A true fine art, my friends. 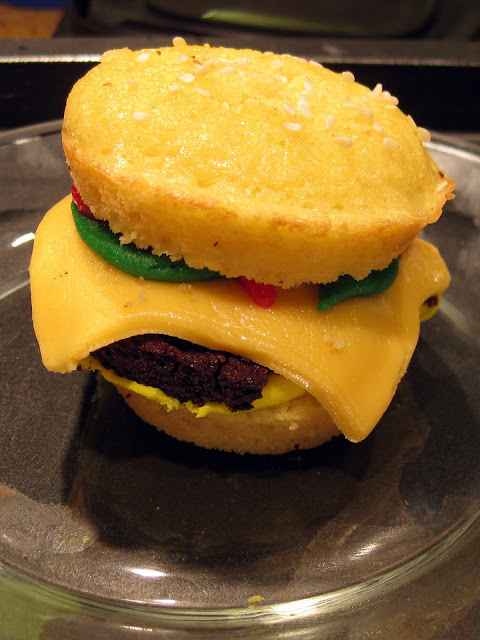 I prepared American cheese-colored fondant to decorate the burger cupcakes with and my friend took care of the rest of the baking and decoration. In total, we probably made 150 cupcake "sliders" for the event. A happy burger cupcake just waiting to gross someone out. Quite a few people were confused until they saw the "burger cupcake" sign explaining the desserts. And after seeing that, some of them were too grossed out by its burger-y appearance to want to take a bite. I made a cake that resembled french fries to accompany the burger cupcakes. To make the "fries," I removed the crusts from pound cake, sliced it into french fry proportions and browned them under the broiler for a few seconds. I then tossed them onto a frosted vanilla cake. 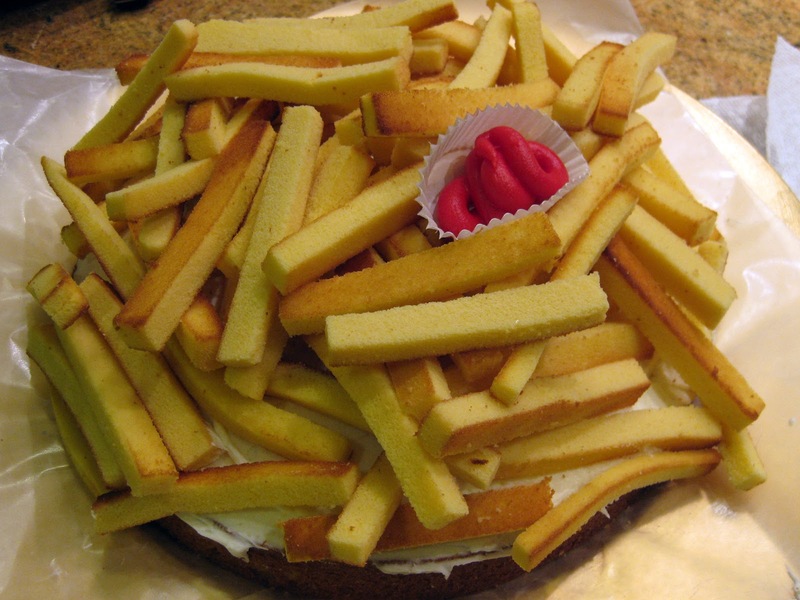 French fry cake, to go with those cupcake burgers. If you try making a cupcake hamburger or two at home, it helps to have a plan for the leftover chocolate cupcake tops. I'd suggest a making a trifle out of them. Or you could just scarf them down. You could also buy a pre-made devil's food cake, slice it up, and cut rounds out of that. It would save you some time and effort, though it might not taste as good as a home-made cupcake "burger" slice, and you would still have some scraps. 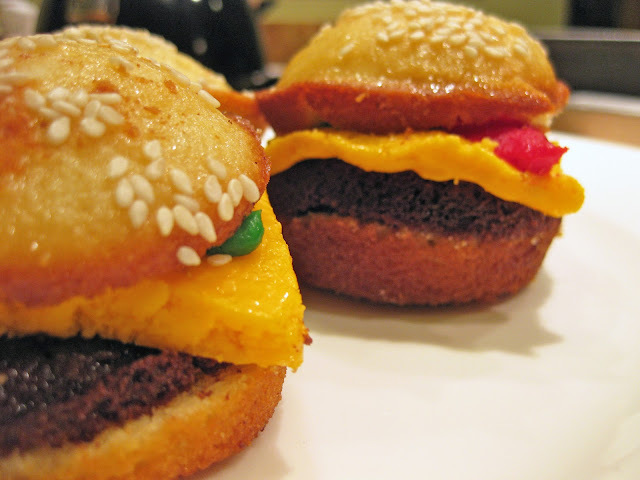 Feel free to ask me any cupcake hamburger questions, and I'll do my best to answer! that looks as gross as it does delicious! Oh, yum. I kind of want it, right now. Ann the Man: these all look awesome. Hope you are doing great! Thanks, Priya! Glad to hear from you - hope you're having a great time, too! I need to make these!!!! Brilliant! Hi JR! Thanks for stopping by! These are definitely some fun cupcakes to serve up!